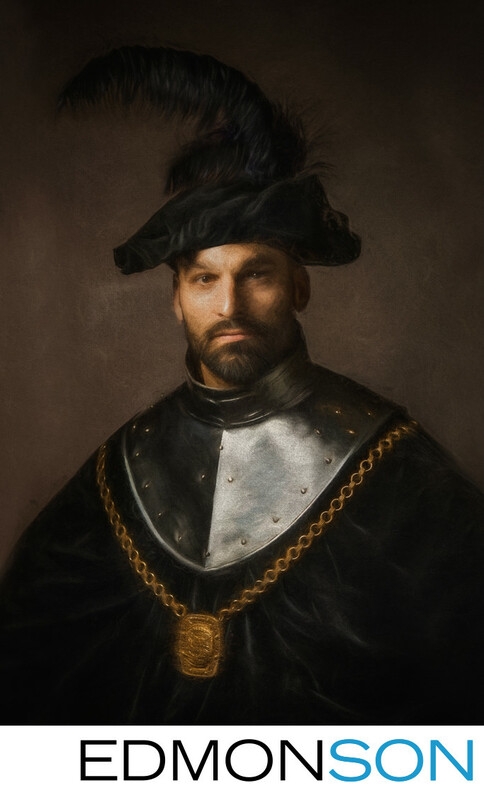 This tribute is an exact duplicate of a Rembrandt painting, where the model is wearing his armor. Rembrandt used that piece of armor as a prop. I believe it was in his possession until he went bankrupt and had to sell it from his prop closet. He also had the gold medallion. My son has studied our family history, and we had ancestors who painted and built crests for noble families. So that is our family crest on the pendant, as I was trying to do a fun little thing that was both unique and personal. In the Rembrandt painting, the subject has a gold medallion hanging around his neck instead. I didn't want to ask the model to pierce his ear like the gentleman in the original artwork who had an earring in his ear. 1/60; f/6.3; ISO 320; 112.0 mm.